It was my second week of class with a new cohort of pre-service teachers when I gave the following instructions for our warm-up: describe what it means to be a professional educator with a sketch. You can’t use any words. You need to express your ideas in symbols. A few students suddenly had to use the restroom. One student asked for an example. Another sketched it quickly, putting barely any effort into it, and flipped the paper over so no one could see it. A few students started to chat about Fixer Upper (hooray for shiplap) and didn’t get started at all. Others looked at their peers to borrow ideas (a nice way of saying “copying”). Suddenly, things changed. Students calmed down and began sketching out their ideas. The conversations about shiplap ceased. It wasn’t perfect but the whole ethos of the classroom changed. Later, we debriefed the behaviors: avoiding work, talking, copying, putting in the least possible effort. I asked them to describe what it felt like to do a sketch-note. While a few students loved it, others described feeling anxiety, fear, and anger. I suddenly realized that I needed to be more proactive. Yes, students needed to own their mistakes. True, we needed consequences. However, I needed to be more proactive in preventing negative behaviors before they occurred. When I was a brand-new teacher, I read a book that promised a magical system that would eliminate all classroom management issues. If I simply followed these rules in the first week of school, it would be smooth sailing for the rest of the year. But here’s the thing: we work with humans and humans are messy. 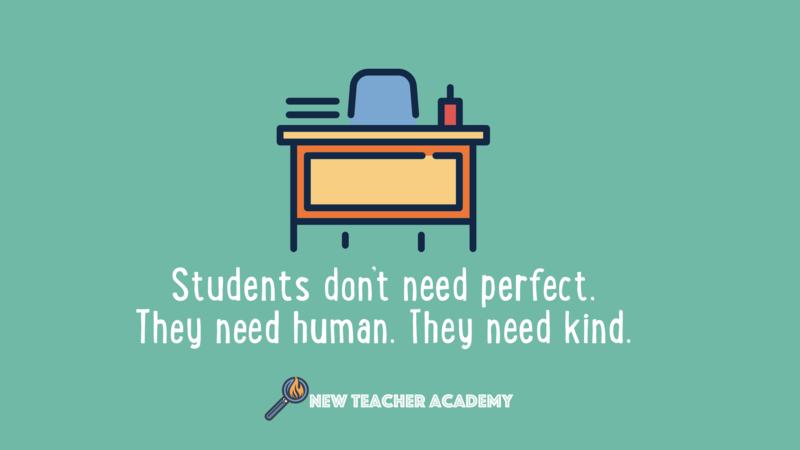 Students walk in with trauma and baggage and even in the perfect environment (and news flash, there is no perfect environment), you’ll still run into issues. Even the most amazing master teachers you meet will still run into classroom management snags. However, while we cannot prevent all behavioral issues from occurring, we can be proactive in our approach. The following are typical problems you might run into and how you can take a more proactive approach. Sometimes students get off-task because they are bored. In some cases, they find the subject irrelevant. I remember hating matrices in Pre-Calculus. I would sneak in novels and hide them under my math book because I simply couldn’t see meaning of a matrix. When I asked my teacher why we needed to learn this, she said, “You’ll need it in college” or “Do you want a good grade?” It wasn’t compelling for me. But as a teacher, I’ve made the same mistake. I taught something out of a “have to” mindset rather than a “want to” mindset and my students were bored and off-task. Sometimes boredom comes from a lack of challenge. Students have already mastered the standards and feel frustrated by the repetition of the content, so they disrupt the learning process. When students are bored, we need to consider how we can craft lessons to be more engaging. Philip Schlecty described this shift from “strategic compliance,” where students play the game of school, to true engagement, where they have are more intrinsically motivated to learn. But how do we get there? The following questions can help guide the way. Is this challenging? Sometimes students check out because they find the work too easy. We can solve this by creating meaningful enrichment activities for students who want to take their learning to the next level. Are students engaged in critical thinking? Students need to engage in analysis, synthesis, and creative thinking. When this happens, they’re more likely to get excited about the learning. Does this relate to their lives? Students want to explore their world and pursue their interests. I remember teaching globalization. Kids were bored and I found myself cajoling them and nagging them. Then we began exploring globalization in our neighborhood and it changed. Similarly, when I switched from a traditional research paper to Genius Hour Blogs (where students chose the topic but still followed the same CCSS standards) I saw a shift away from disruptive behaviors. Is there any creativity? Both Trevor and I used a project-based approach to teaching. We both found that PBL incorporated student choice and buy-in. I remember worrying that students would get off-task if we switched toward epic projects. I was worried that a second-year teacher couldn’t do projects. However, in my experience, students are more likely to be fully engaged when they are working a project they’re excited about. I realized that you could do epic projects even when you were new. For example, when I taught proportional reasoning, volume, and surface area with textbooks and worksheets, I found myself resorting to compliance and consequences to get students to engage in the learning. But when I shifted to a Tiny House Project and integrated the direct instruction into the larger Tiny House Challenge, students were more likely to ask questions, take notes, and compare strategies. We still had some “traditional” lessons but it was within the context of a project. There’s a different type of boredom that has less to do with boredom and more to do with a general restlessness. Here, students are antsy and impatient. They might be staring off at nothing or tipping their chairs or passing notes. They might be sneaking peaks at their SnapChat or doodling comic book pictures in the margins of the textbook. For me, this is nearly always a sign of a pacing problem. We’re moving too slowly through a task and they’re ready to move on to something different. Sometimes you need to cancel the current task and switch to something new. However, there are moments when the lesson is well-crafted and you need students to stay focused. In these moments, you can break it up with a quick two-minute brain break or divergent thinking activity. Other times, you might want to do a quick cooperative learning activity. Sometimes, students simply need a quick think-pair-share to process what they’re learning. As a more preventative approach, you can focus your lesson planning on varying the grouping so that students have time to work individually, discuss ideas with a partner, and engage in group work. Some students are really more social and simply need the opportunity to talk. I remember saying to a friend, “I have a really chatty group,” and he responded with “how often are they getting the chance to talk to one another?” When I analyzed my lesson, I realized students were only getting the chance to talk about 10% of the time. So, I redesigned it to incorporate more peer and group discourse and then, when I did direct instruction, I would say, “I need ten minutes of your time and then you’ll have the chance to talk.” It made a huge difference. Ever given directions to students only to face a class of glossy-eyed students and a sea of raised hands minutes later? Yeah, me too. I can’t count the number of times when students got off task because they were confused about what they were supposed to do. Sometimes you need to remind students of the classroom procedures. If you’ve created a procedure chart, this is a chance to review it. However, other times, the issue involves a lack of clarity in assignment directions or lesson materials. One strategy that worked for me was to have students annotate a document and ask clarifying questions. This allows me to refine my materials to be more student-friendly while also modeling the risk-taking involved in asking questions. Students learn that it’s okay to ask for help and clarification. Then something happened. The class grew more and more disruptive and they didn’t listen to me when I corrected them. One of the easiest fixes is to reflect on your own body language. As a new teacher, I loved Tools for Teaching by Fred Jones, because he focused on things like posture, space proximity, and avoiding nagging (which was a real issue for me). Is my voice approachable or authorative? Often, teachers use a tone of voice that’s approachable with students only to find that kids don’t respond to the tone seriously. Am I making use of space proximity? In other words, are you slowly walking toward students who are talking when you’re talking? Does my body language convey authority? Take some time to rehearse your approach in front of the mirror. I know, I know. That sounds weird. And it is. But weirdness is part of the gig. And, I promise that this works. Am I staying consistent with hand signals and waiting? Sometimes I forget to use a hand signal and wait for silence. There are times when you might need to do a reset and bring your class together to re-examine your norms and procedures. If there’s a genuine problem with the classroom cultures and relationships, you might need to take a Restorative Justice approach. That’s the approach I had to take with my sixth period class. All those veteran teachers were right. You’re not their friend. You’re their teacher, which is better than being a friend. You’re the architect designing epic lessons. You’re the mentor guiding them. You’re the stable adult listening to them when they share something that breaks your heart. In some cases, you’re the lone adult who cares for them every single day. I once had to fix a broken sprinkler system and I had moments when I shouted at myself (using some salty language), fought back tears, and even gave up early and binge-ate a whole box of Cheez-Itz. It wasn’t even a small size box. It was a family size box. I ate a whole family’s worth of Cheez-Itz! I spent hours working out of my weakness and I felt lost. But then I found help. I watched a series of YouTube videos and tried things out. I got past my pride and called my dad to ask for help. It was still challenging but suddenly it felt doable. It was the first time I truly “got it.” As a third year teacher, I knew that students were frustrated when the work was too hard. But this project gave me a newfound empathy. 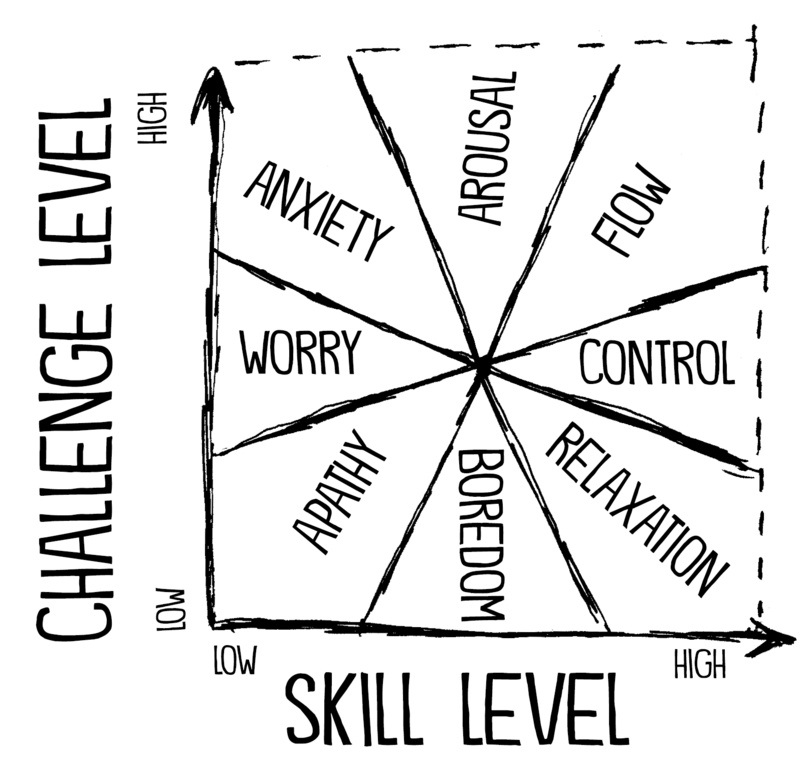 In Flow Theory, they describe the need to match the challenge the skill level. When students have a low skill level, they will often experience anxiety and apathy. This is why we need to provide meaningful scaffolds for our students. This might include sentence stems, tutorials, templates, anchor charts, and exemplars. While this can feel daunting for teachers, it can help to ask students to self-select the scaffolding. Other times, you might want to modify the quantity of the work. In education, we tend to place a high premium on getting the right answer and getting it quickly. Students internalize a fixed mindset, convinced that they are bad at the subject simply because it takes them longer to finish. However, when we allow students to work at a slower pace, they don’t feel as overwhelmed by the sense that they are always behind. So, a student might write fewer paragraphs in a warm-up or do fewer math problems. When my students write blog posts, I will make the directions more flexible. Instead of saying, “Write a three-paragraph post,” I might say, “Write a blog post at your own speed. Most of you should do three or four paragraphs but it’s okay if you can only write one or two.” The students who traditionally write three paragraphs often write four while the students who give up or disrupt the class are more likely to write one or two paragraphs. Classroom management is a craft that takes years to master – and even then, perfection will remain elusive. It’s important that we show ourselves some grace when we mess up and that we show our students the same grace as well. Really useful, easy solutions to classroom management. We get stuck in the everyday mode of teaching without reflection of what is happening in the classroom.